The day before Manchester City completed the signing of Real Madrid sensation Robinho, two more South Americans arrived at the City of Manchester Stadium. Brazilian centre-half Glauber Berti was signed on a free transfer from FC Nürnberg, while Argentinian full-back Pablo Zabaleta joined from Espanyol for a fee in the region of £6.45 million. To most City fans, both were completely unknown, and none would have predicted that one of them would go on to become a club legend. While Berti’s first and only appearance turned him into something of a club icon, it was Zabaleta who captured the hearts of City’s fans. Despite a slow start to life in Manchester, which included an ill-timed red card in the 3-2 loss to Liverpool, a match which City had led 2-0, the City faithful took an instant liking to their new right-back. I’ve previously written that the City fans are a forgiving bunch if it is evident that a player is putting in maximum effort, and it was perfectly clear that Zabaleta gave his all every time he stepped onto the pitch. It’s no exaggeration to suggest that Zabaleta is a near perfect embodiment of everything a fan wants in a player; a rare blend of technical ability and a never-say-die attitude. In an era where Manchester City have had their fair share of divas, Zabaleta has maintained an outstanding level of professionalism, both on and off the pitch, something which has endeared him to the blue half of Manchester. Zabaleta’s professional qualities have been evident throughout his eight years in Manchester. The Argentine was more often a substitute than a starter, and only really cemented his place in the starting line-up during the last six games of the 2011/2012 season, when Micah Richards picked up an injury. It was a similar story with his national team, having to wait for the retirement of Javier Zanetti in order to gain his chance. Managers clearly recognise the superb example that Zabaleta sets for the rest of his team-mates as he has gone on to captain both his club and his country on a number of occasions. 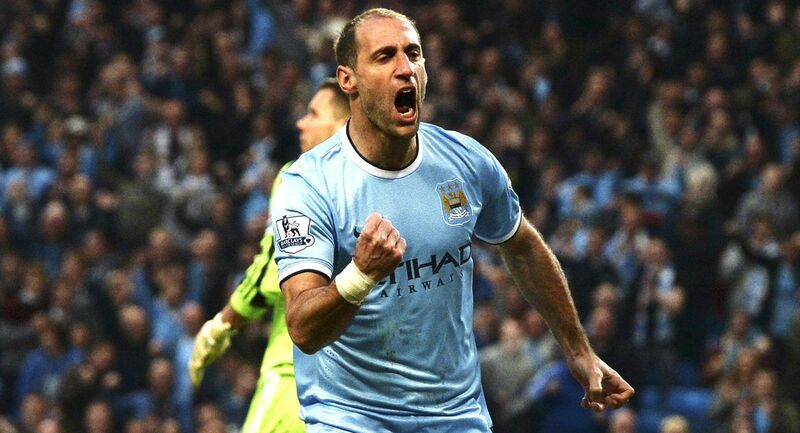 But age catches up with all players unfortunately, no matter how hard-working they are, and Zaba is no exception. It pains me to write this, but our Argentinian warrior is a mere shadow of the player he was two or three years ago. While he has retained his drive, determination and desire, his physical condition has deteriorated drastically. City’s reliance on Zabaleta as first choice right-back, prior to the arrival of Bacary Sagna, has damaged the longevity of his career significantly. In the 2012/2013 season, Zabaleta played in all but five of City’s matches, thanks to his understudy, Micah Richards, picking up an injury almost every time he played. This strain, coupled with the natural effects of age on a footballer, have seen an enormous regression in Zabaleta’s performances. A key indicator of Zabaleta’s decline is conveyed by his inability to complete one of his usual defensive actions. Zabaleta often moves inside in order to double up on the player with the ball, which then leaves a gap on the wing. A couple of years ago, if the ball was played out to the wing, Zabaleta would be able to make up the ground quickly and put in one of his trademark last-ditch tackles. However, he has lost a yard of pace, meaning that he can no longer cover the ground in time, thus leaving a massive gap to be easily exploited by the opposition. The most recent example of this was in Wednesday’s Champions League draw at Celtic. Zabaleta was drawn in-field, leaving the onrushing Kieran Tierney to a free run down the wing. Raheem Sterling then bust a gut to try to cover for his right back, but his efforts were in vain, turning Tierney’s cross past Claudio Bravo to put Celtic 2-1 up. Another indicator of Zabaleta’s deteriorating physical condition is the sheer number of injuries which he has picked up in the past two seasons. Prior to last season, Zabaleta had missed just nine games through injury since joining the club in 2008. Unfortunately, in the 2015/2016 season alone, Zabaleta missed 23 games through injury. This resulted in him losing his place in the side to Bacary Sagna, a place which Zabaleta has failed to reclaim since. Watching Zabaleta play nowadays is really tough, his body just can’t work as quickly as he wants it to. It almost seems cruel when he is put up against top quality opposition. His performance on Sunday felt like death by a thousand cuts, every unsuccessful tackle and missed interception slightly more painful than the last. In previous years, Zabaleta would have the beating of his opposite number almost every game, but he currently seems completely unable to deal with any sort of attacking threat. His attempt at stopping the cross of Arthur Masuaku, which led to West Ham getting back into August’s game at the Etihad, can only be described as pitiful. The harsh reality is that he no longer seems capable of even playing a bit-part role at the club. If truth be told, it came as a great surprise that Zabaleta was allowed to stay at the club beyond last summer. Sentimentality aside, it was clear that he was no longer of the required level for a club with City’s ambition. The Argentine had some great offers on the table; Roma and Inter Milan, clubs of tremendous stature, in a league which would have suited the style of an ageing full-back. By rejecting these approaches, Zabaleta may have made a rather costly error. Zabaleta should seek to leave the club at the earliest opportunity, in order to avoid his legacy being tarnished, something which we have seen on a number of occasions recently. Martin Demichelis, to a lesser extent, had become a club icon after overcoming a difficult start to become the club’s most reliable centre-half for 18 months. But just like Zabaleta, age caught up with him. Demichelis’ final season in Manchester was a disaster, committing a number of individual errors and turning in some dreadful performances, most notably in April’s 1-0 loss in the Manchester derby. While Demichelis is still held in high regard by the City fans, his final season at the club will live long in the memory, for all the wrong reasons. The most obvious example of a player’s legacy being tarnished at City is evident in the form of a certain Ivorian. Yaya Touré is arguably the most important player in the recent history of the club, with his goals almost single-handedly transforming the club from underachievers to heavyweights. Yet a mixture of poor performances and an obnoxious agent has led to waning support from the majority of City’s fans, with many eager to see the back of the man who brought them so much joy. It would be genuinely heartbreaking to see Zabaleta’s reputation decline in the same fashion as Demichelis’ and Touré’s. He deserves to be remembered as someone that the club could always rely on, and not the liability to the team that he currently is. The sooner Zabaleta leaves the club, the sooner we can put the last two seasons behind us, and remember him for the right reasons.